Plantscapers gains another platinum award for their Class A high-rise lobby design for The Ruth Group. Plantscapers’ Julie Davis Farrow, Mark Farrow and Jason Cupp were there to receive the awards. Susi Tomich, design consultant for Plantscapers who won the award for the design, unfortunately could not be present. Susi wins another platinum award for her design work. Susi won for the second time the prestigious Platinum International Plantscape Award in the Design category for usage of live plants where she had created a stunning design at a high-end lobby for the corporate real estate firm, The Ruth Group. Susi worked closely with Ware Malcomb to complement the lobby and make it inviting for high-end tenants. She handpicked 12′ Rhaphis excelsa from the growers, having to hold and care for them at our facility for 3 months due to construction delays. 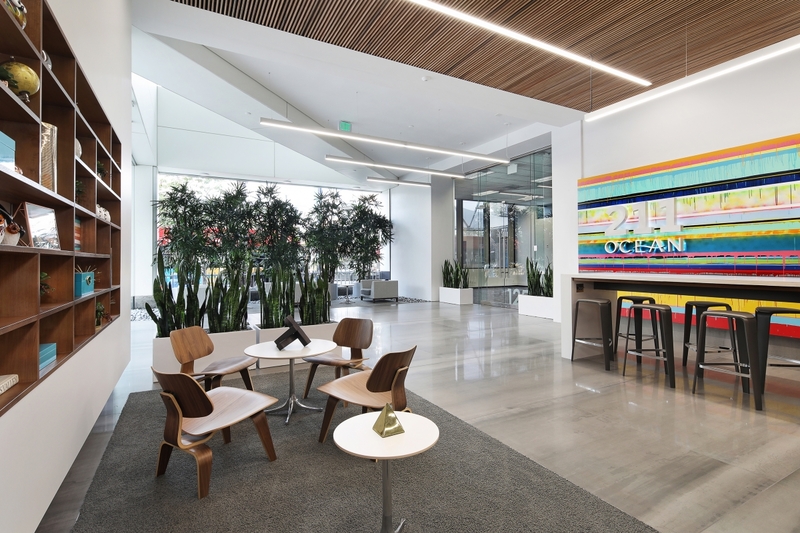 This fun, colorful light lobby came alive when the plants arrived and inevitably is the perfect attraction to bring in the right tenants and employees. 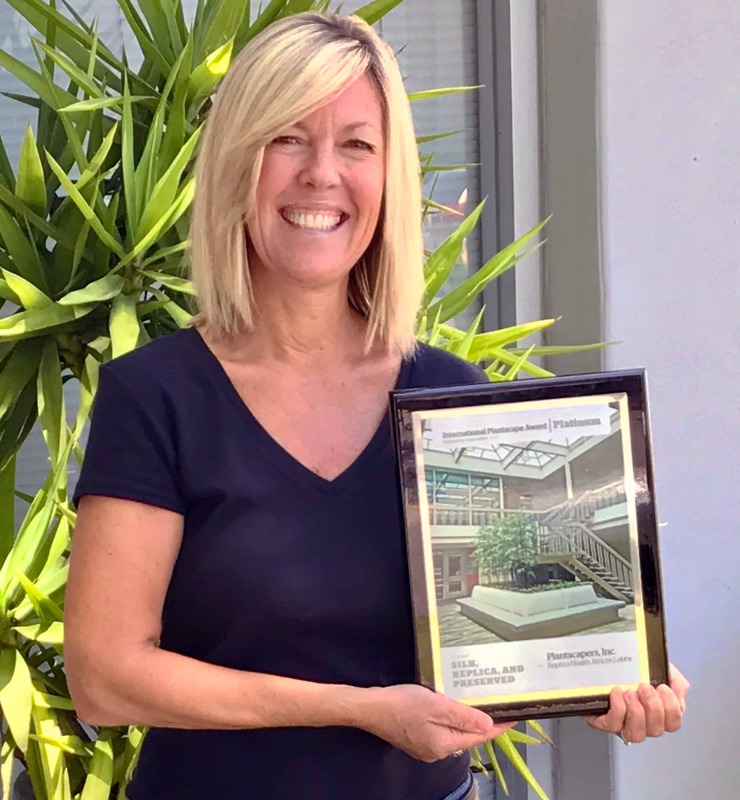 American Hort presented the International Plantscape Award at a ceremony that distinguishes designs created by interior plantscape professionals. Last month the horticulture industry met at Cultivate’17 where the awards were presented. Interior spaces come alive when the plants arrive. The 12′ Rhaphis palms deflect the busy traffic outside while promoting a relaxed interior inside. 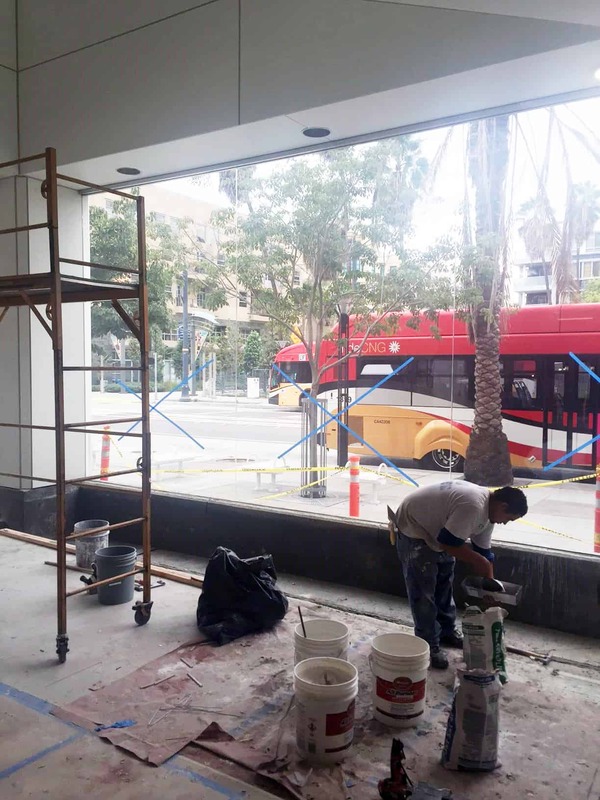 The lobby window is getting prepped for the arrival of the Rhaphis palms. The advantages of placing plants indoors are many and have profound effects on the surroundings. 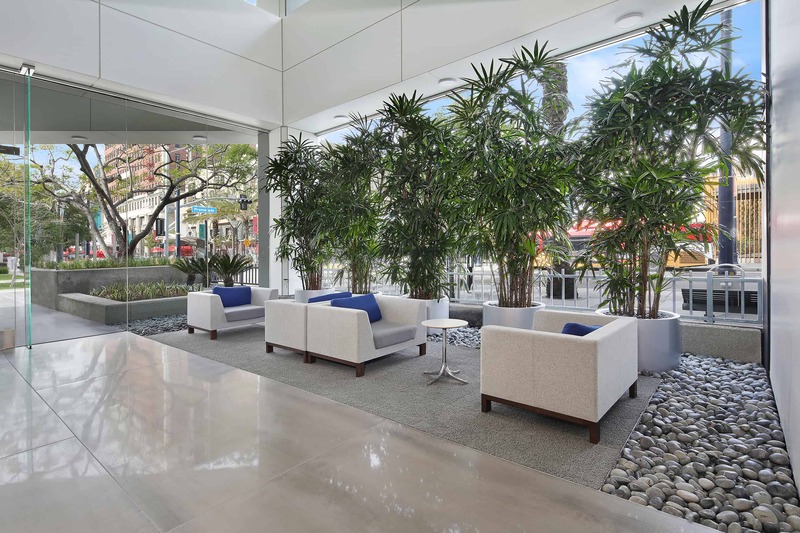 For a lobby, it is the first area greeted by residents and visitors to provide a welcoming experience. The plants enclose the area with a mode of relaxation and delight. The whole effect says ‘welcome’ to anyone who steps foot inside this design, and is an element utilized in the Well Building Standard. 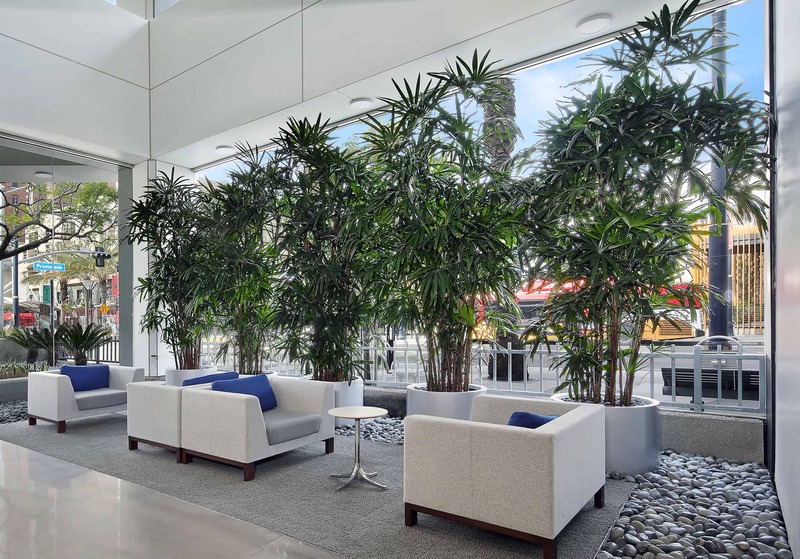 From a large window with a big space, to an area for sitting and gathering, the lobby design with its strategically placed plants separates the area into distinctive parts, but doesn’t discourage the flow of space. Living trees placed indoors softens and soothes the environment. Modern short cylindrical containers blend in with the design to create the feel that the palms are actually rooted in the bed of river rock below sprouting up through the containers. The palms long flowing form reaches upwards to deflect the busy traffic outside while promoting a relaxed interior inside. 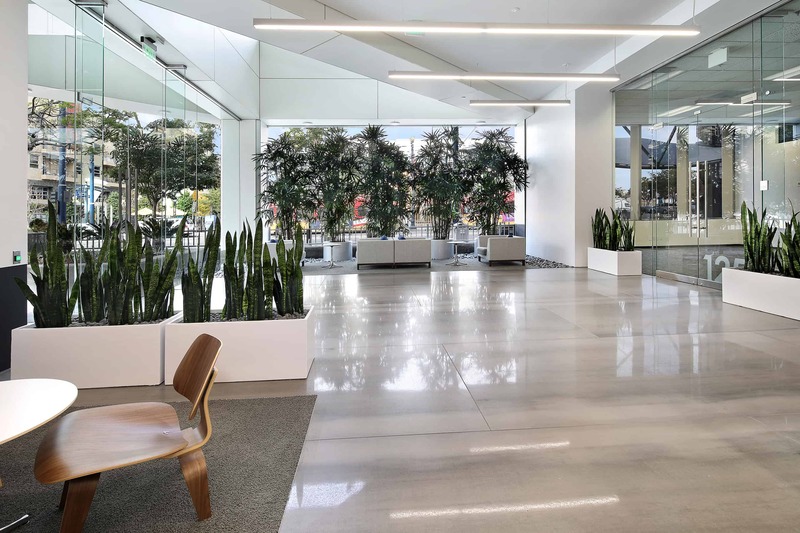 We thank everyone involved, especially our team at Ware Malcomb, for specifying plants in the planning stages; and for their dedication and talent in transforming this space into a vibrant, welcoming lobby to be enjoyed by many in the years to come.